It’s been pointed out on this site multiple times that more often than not when a company “decides” to pull one of their money making products off the market, it’s not so much their choice as it is a thinly veiled threat from the FDA. 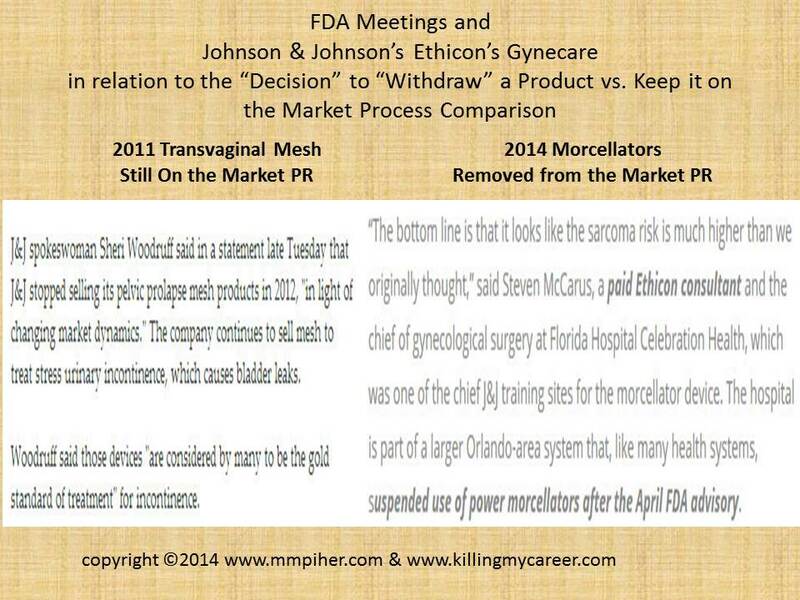 Most recently with Johnson & Johnson’s Ethicon’s Gynecare’s “withdrawing” their possible cancer causing morcellators. 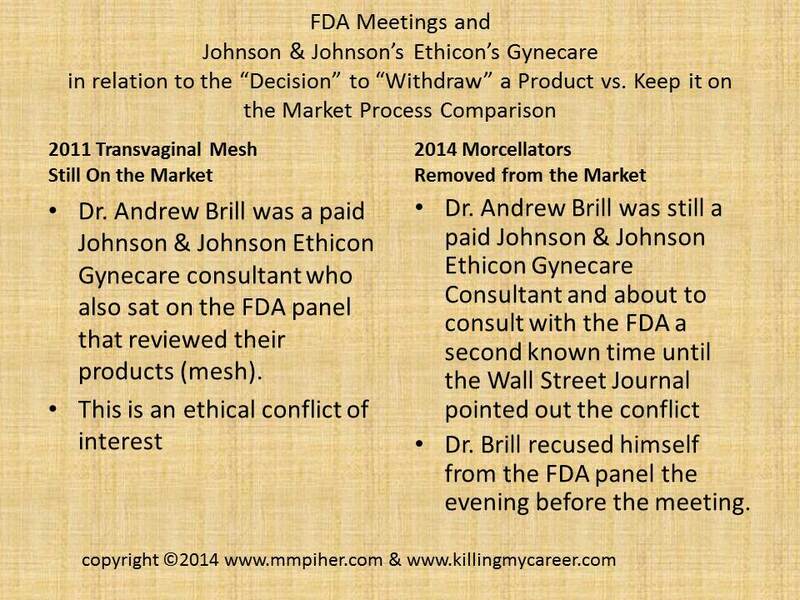 Does Dr. Andrew Brill’s late last minute departure from the FDA panel play some part in Johnson & Johnson’s later decision to pull the Ethicon Gynecare Morcellators? Just because the FDA may not have a strong enough case at a certain point in time does not automatically indicate that a device is safe. The FDA may not have enough evidence at the time of the meeting, it doesn’t mean it doesn’t exist though. 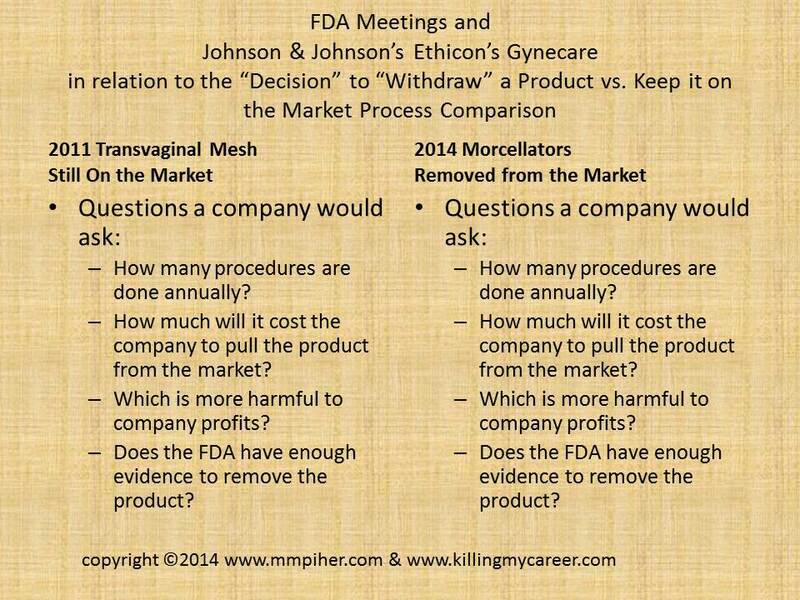 The facts are starting to develop which may not be favorable to Johnson & Johnson’s image. The money making product is incorrectly referenced to as the “Gold Standard” as a justification to keep a product that has harmed women on the market. 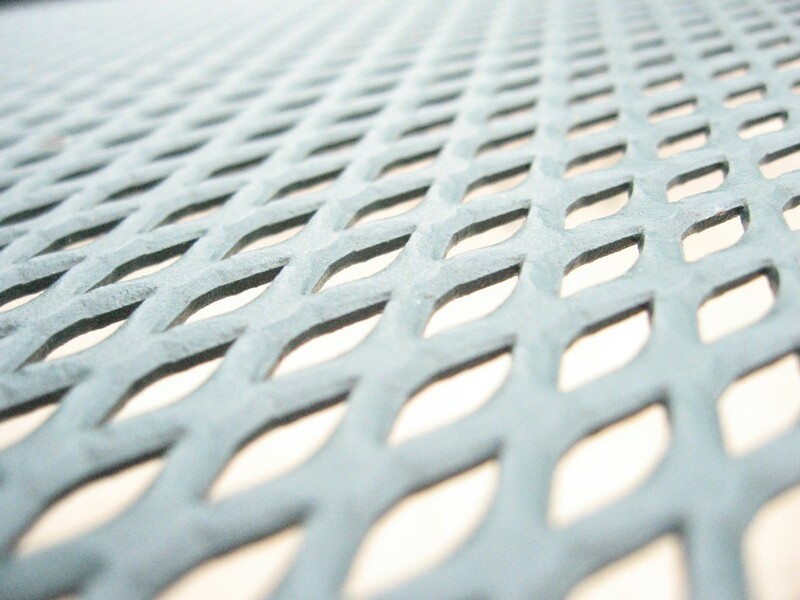 The lesser used and harmful product is removed from the market. 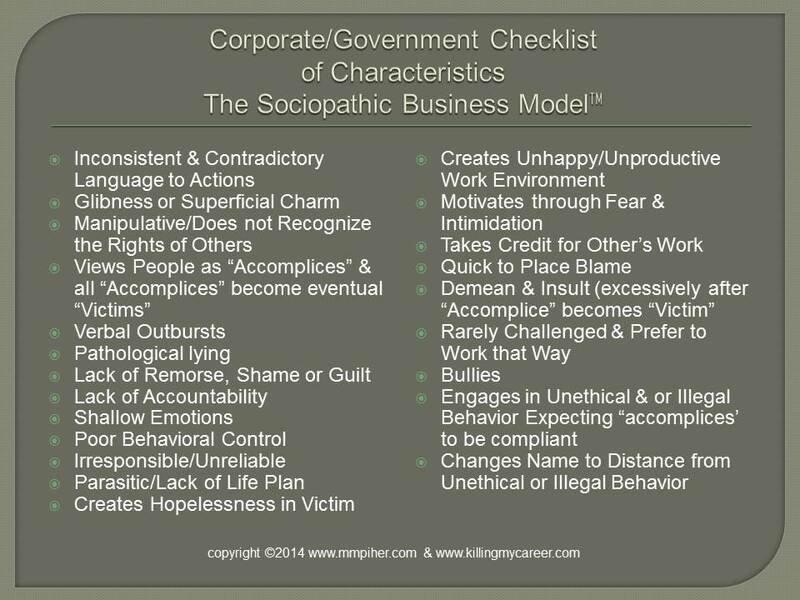 Did they remove the product because Johnson & Johnson’s company name could not take another negative hit with public perception? 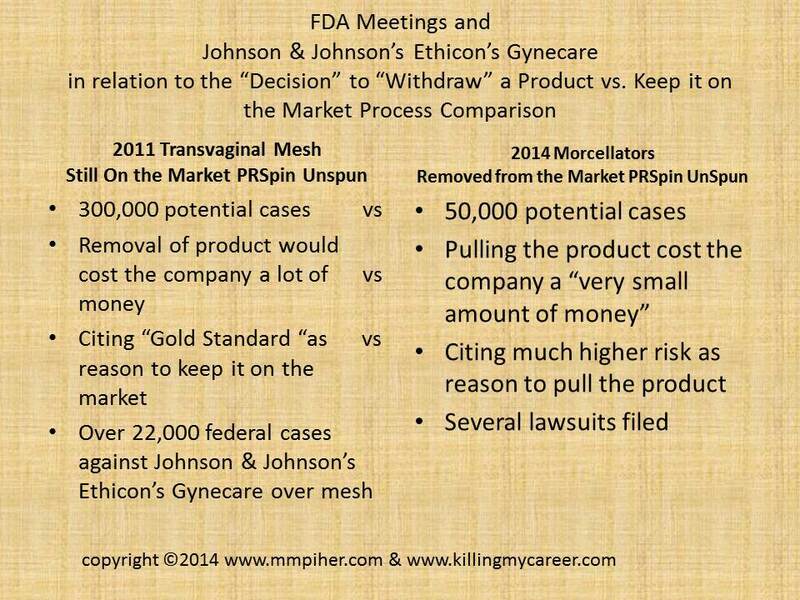 Did they remove the product because Johnson & Johnson was not comfortable without having their paid consultant Dr. Andrew Brill on the FDA panel? Fact based evidence over time is a good indicator of the future. The facts are pointing to Johnson & Johnson putting profit above their patient’s needs. 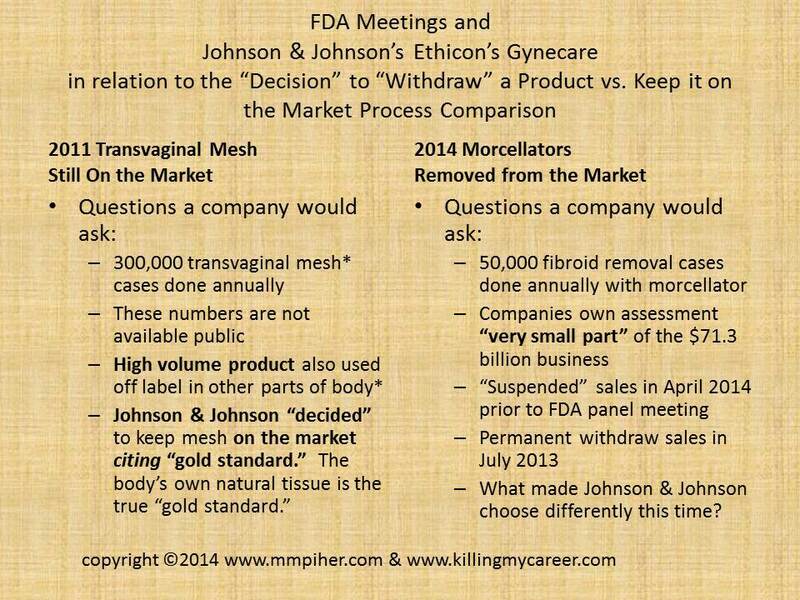 Sheri Woodruff, Johnson & Johnson spokesperson referring to mesh as the “Gold Standard” to me is nothing more than a pathological lies to justify the selling of a product that is known to harm patients. 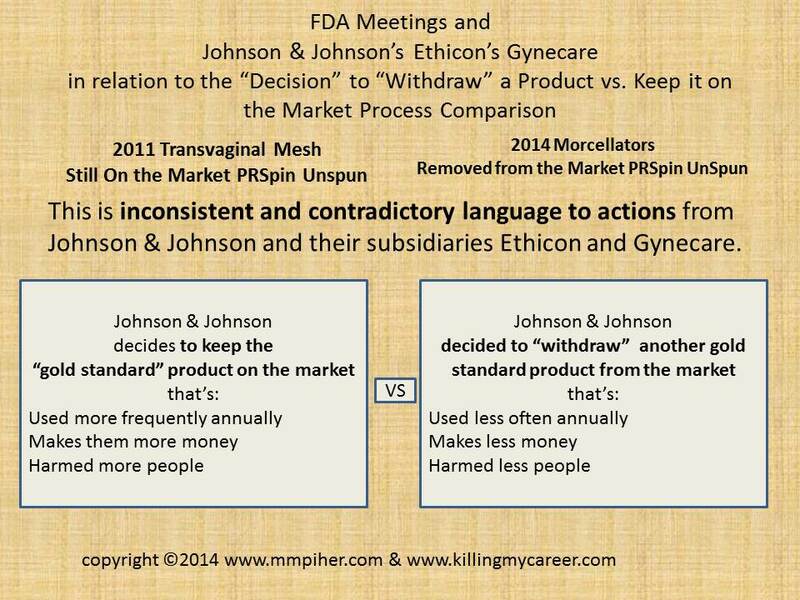 Johnson & Johnson manipulates data and does not recognize the rights of all their harmed patients and only focused on a small subset that cost the company less money in profits. There are national television ads and many websites speaking out of how victims of mesh feel hopeless. 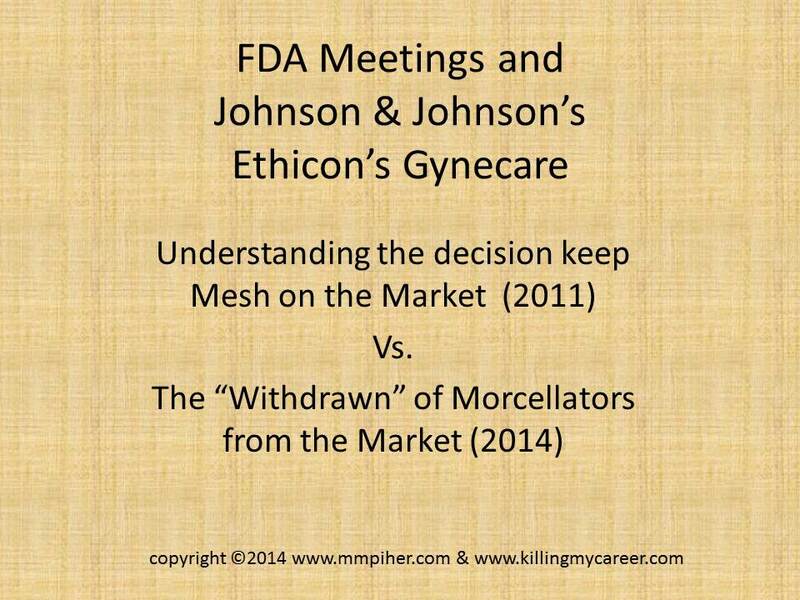 It will be interesting to see how many more name changes division of Johnson & Johnson will go through during the highly publicized Mesh and Hip cases. Again, each person reading this has free will to make decisions based off of facts. 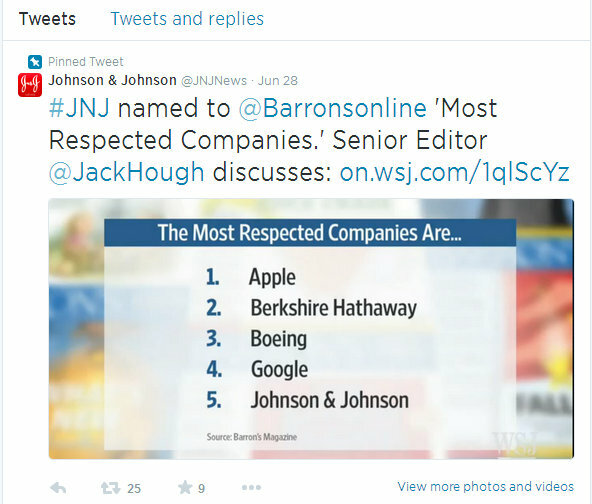 For me, it’s pretty tough to look at Johnson & Johnson as ‘A Most Respected Company.’ Their PR team works tirelessly to direct their image towards babies and baby shampoo, when it’s known they’ve killed children, hurt women and men with mesh and hips all without any remorse, shame or guilt showing me they profit before their patients.